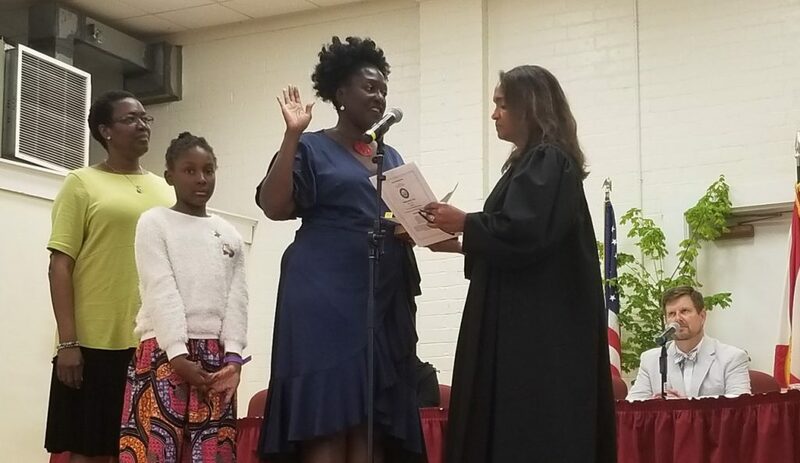 The swearing-in of Gail Johnson and Gigi Simmons in May earlier this year marked the first time in Gainesville’s history that two black women served on the city commission simultaneously. Then, it was time for newly-elected Commissioner Johnson, now representing the entire city, to get to work. While she had never held public office before, she said she’s a quick learner and has been absorbing as much as she can since taking office. We sat down with Johnson to learn about her daily routine, some of the projects she’s hoping to spearhead and the different perspective she brings to the commission. Below is an excerpt, edited for clarity and brevity, of our conversation with the newly-elected commissioner. What are some of the things you’ve been up to since taking office in May? We’re in week five and it’s been a great time. It’s a lot of information. I mean, we walked into a few kinds of fires that I mean literally I feel like we had to put out with the [Fire Services Assistance Agreement] and I feel like we came to a good place with that. There’s still some things with the city and the county that we have to get figured out like the joint planning agreement and kind of what the new direction for the CRA is going to be. So, those issues, as soon as I came in, were issues that we had to deal with within our first two to three meetings. So, I think now is going to be an issue of being able to balance everything in the city that we need to do on a day to day basis to make sure the city runs well and make sure that everybody is being taken care of. You know, there are a lot of negotiations going on with some of our labor groups like RTS, so these are issues that are kind of front and center for us right now. I’m committed to making sure that our RTS bus drivers are paid a living wage and being paid well for the services that they do, so that’s something that’s been on my mind. Today I went to tour the facility and talk with management and I was also able to talk with the head of the labor union, Mr. Durham, so that’s kind of been on my mind. I came back from a really incredible conference recently in Baton Rouge, Louisiana and it was a conference dedicated to equity and equality in Louisiana, so you had people from all over. It was one of the only conferences that I found nationwide dedicated to equality and equity, specifically in Louisiana, but what I took from that conference was, and what I think that Gainesville can do a much better job at that is something I would like to kind of spearhead and I think the city should spearhead, is working on getting people out of their silos, getting people to work together collaboratively to address the issues that we have with equity in everything, from criminal justice to education to affordable housing. 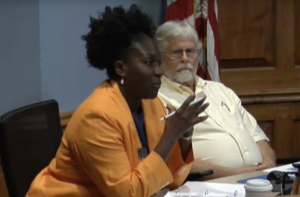 So that is going to be one of the big lifts I feel that this city… The conference will be the next step in the evolution of the inequity in Alachua County report. So this is what I feel the next step is, and I’m hoping that my commissioners, and also the community, will be supportive of this because it really is, like I talked about in my campaign, going to be all hands on deck to try to figure out. We know what some of the issues are but actually being dedicated to fixing them and then what those next steps will look like. So that’s something I’ve been working on. It’s important to me to be able to communicate with people and be an open door so I’ve had a lot of meetings with people. I continue to set aside at least 12 hours out of my week just to meet with people that want to talk with me about anything. So, I have an open door policy, and it’s important to me to be able to hear what the concerns are, and then be able to act on them, so I enjoy meeting with people. So, in order to stay abreast in what’s happening and make sure the people are involved, I’m going to have a community conversation and the community is going to choose whatever they want to talk about, whether it’s GRU or affordable housing or education. I’m going to put out ten topics and whatever people want to talk about, we’ll put a survey out, we’ll talk about it. We have a date, it’s September 14th, and space is to be determined. So, I’ll put that out pretty soon. As you and Commissioner Simmons took office, there was a lot made about the historic nature obviously of your wins and swearing in. Now that you’re governing, how is that translating into action and results for the community being the first two black women to hold this office at the same time? There’s still the day-to-day business of governing the city which we’re both learning. I’m learning, but I feel like I’m kind of a quick study so I’m able to understand things and make decisions, but there’s also not losing sight of why we’re here. 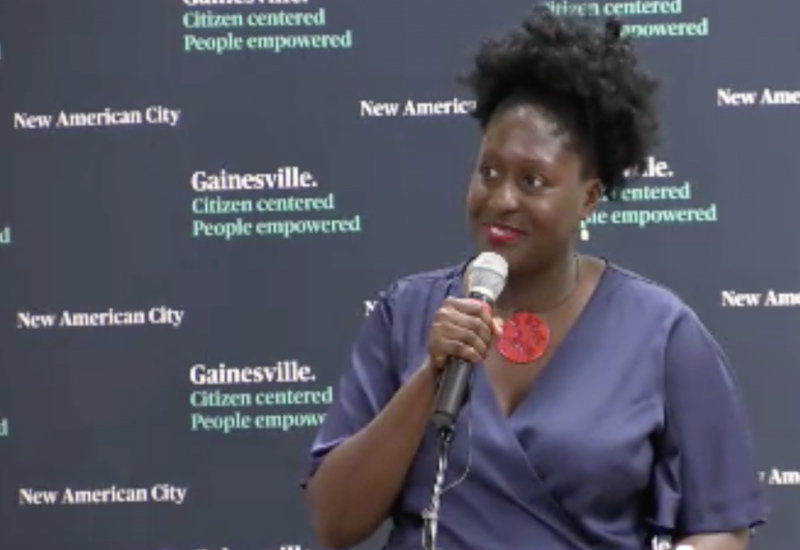 Particularly, I talked a lot about equity in Gainesville, making sure that people’s literal basic needs are being met. There’s such a division right now. There’s economic division, there’s racial division. 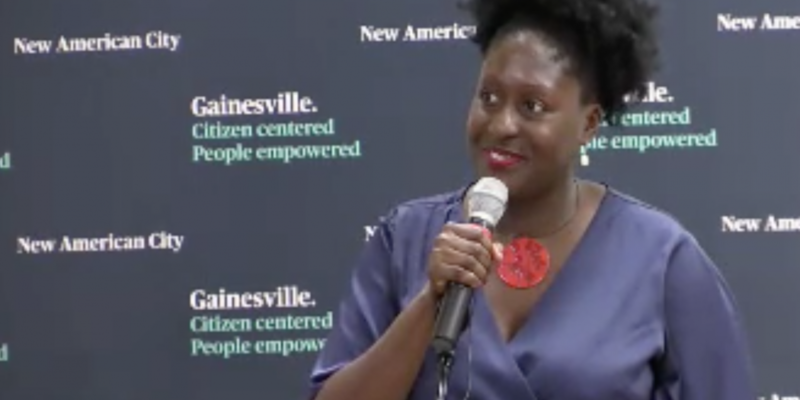 There are people who are living really well and there are people that are not living well, and there are people in Gainesville who are living really fabulous lives and there are people in Gainesville that aren’t, and I’m really concerned about the people that need help, that need access to good, quality food, that need access to healthcare, that need access to child care so that they can work so that they can go to school. Making sure that we have transportation so that people can get to work, like literally people’s basic needs. I think technology, infrastructure, all of that is very important, but also to making sure that the balance between east and west, that there is that balance. So, we need to address those infrastructure needs and we are doing that as a city. I think that we’re doing great work that started before I even thought about running for office. So it’s about, one, supporting the people that are already doing that work, and also I believe that government sometimes needs to step in if the market isn’t addressing the needs of affordable housing. If they aren’t addressing the needs of food, then there’s something we need to do as a government to make sure that somehow we close that gap. Small businesses, which I know is something close to your heart as an owner yourself: What else can the city do or is planning to do to support those? And that gets to your point about equity as entrepreneurs are finding their way themselves. This is what I do think: There are groups out there doing exceptional work, and we need to support those people doing the good work. So there’s a partnership between the Cultural Arts Coalition, UF, the city and a few other groups. It’s a group of about six different organizations, the Cultural Arts Coalition being one of them, headed by Nkwanda Jah, and she, along with the other folks, help to nurture and develop both entrepreneurs and startup businesses and kind of midsize businesses that go through this program. At the end of six weeks, whatever you need, there’s a mentorship program, there is help with business plans, they’re starting a micro lending piece of that. Those groups that are already doing the work, I believe that it is incumbent upon the city to help support that. I also want to find out from the business community what exactly the needs are, and my focus is really more on that entrepreneur/small business. There’s another group that I’ll mention out of UF that’s specifically having to do with women and incubating women businesses, and not technology, because there is a lot of that going on, but just small, women-owned businesses. So there’s some groups doing work in the community. So I want to hear from entrepreneurs and small businesses what kind of support they feel the city can give, and I’m planning on having another kind of community conversation around that in late October to the beginning of November. 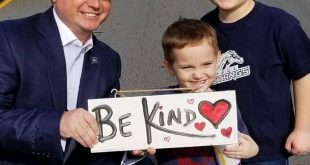 Is there a particular constituent that you met during the campaign that you made some sort of promise to or you think about as you go about your daily governing that you really want to keep in your mind? Yeah, and you know what, it’s everyone. I think it’s all of us. I am a mother, so the lens that I look through is often through the lens of being a parent. 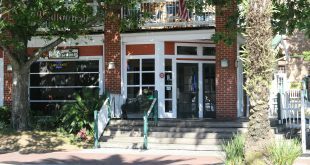 It’s through the lens of being, having been… I was going to say poor, but I’ve used many of the services in Gainesville to help kind of get a step up. I’m familiar with places like the Early Learning Coalition where I was able to get subsidized childcare when I was working at a minimum wage job and also starting my business. So, working like 70 hour weeks. So, the lens that I look through I think is probably a little bit different, so as a go through my day, yeah, I’m thinking about working people. I’m thinking about people that are maybe not able to shop at Whole Foods on a regular basis. Basic needs. And we’ll close on this: You mentioned your schedule, so, what’s it like? Are you still maintaining your business? I am not maintaining my business. It is 100 percent governing right now because this is more than a full-time job. I think that if you are doing it the right way, especially being new and everything that we have to learn, all the people that we meet, all of the meetings that we have, it’s more than a full-time job. So, I’m turning my kitchen into a co-op kitchen, so there’s going to be three other small businesses working out of there. I’m starting that just on Sunday, July 1st. So on non-meeting days that are not going to 11 o’clock at night, what is your typical day like here? Today you mentioned those 12 hours of meetings you try to set aside during the week, but you’re doing sight-seeing tours, meetings, what else? So I did that with RTS today but it is about, and it’s all optional, but I’m choosing to do this, but just within the city there are 24 departments, so I’m literally meeting with every single department. Same with GRU… I’m going through all those departments talking with people. Also, just meetings with anybody who wants to talk with me. Anybody who wants to come through my door, I’m here. And the regular city meetings on top of that. Then there’s also preparation for the meetings. If you will look at, see those big binders, those two big binders right there? 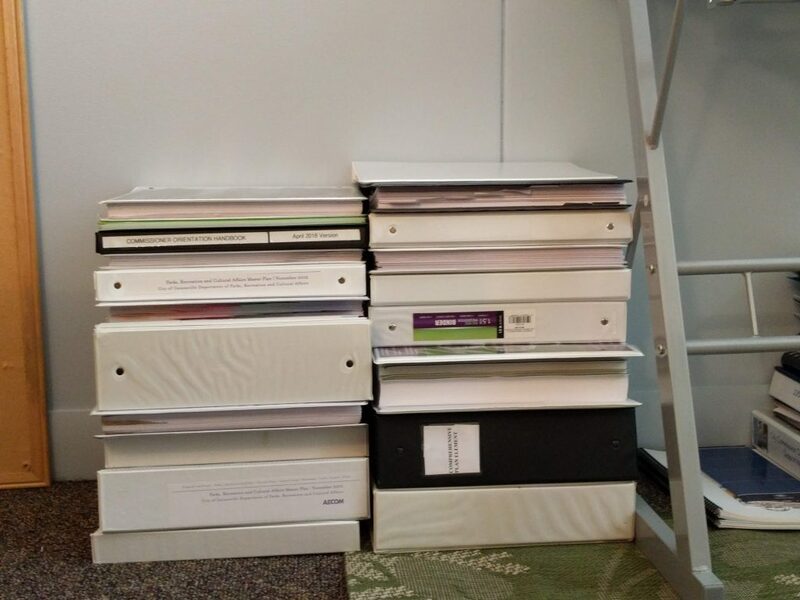 Just for the general policy meeting it was two big binders of backup. I’m not printing them anymore because I realize that’s like three trees, so I’m not doing that anymore. I did not realize until I asked someone to help me kind of prepare for that that it was that thick, but just the backup for the meeting alone. 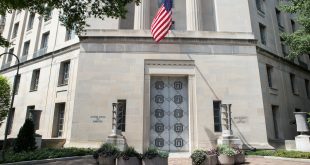 If you prepare and you do the backup and you ask the questions and you find out more information from the departments and you help to, you know, whatever is on the agenda, put that together, it’s quite a bit. So there’s the preparation for the meetings too, which being new, it’s going to take me a little bit longer than it’s going to take Mayor Poe who’s been around for 10 years. So, I try to be thorough.